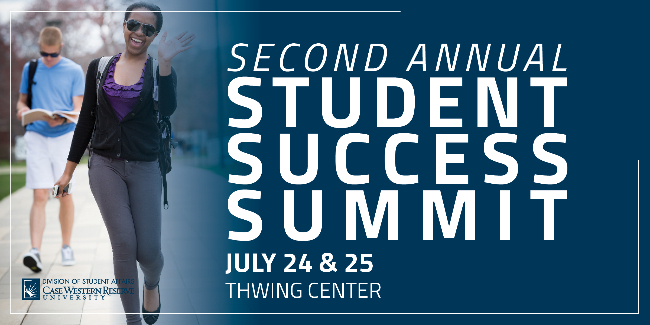 The University Office of Student Affairs will host the second annual Student Success Summit July 24-25. The Summit will focus on how faculty, staff and administrators can Connect with colleagues across campus, help one another Grow and expand knowledge of campus resources and student support services in an effort to have a positive Impact on students’ social and emotional well-being and academic success. The summit will be held July 24 from 8:30 a.m. to 4:30 p.m. and July 25 from 8:30 a.m. to 12 noon in the Thwing Center. President Barbara R. Snyder and Vice President for Student Affairs Lou Stark will provide opening remarks, followed by roundtable discussions, workshops, luncheon keynote speaker and other members of the community.